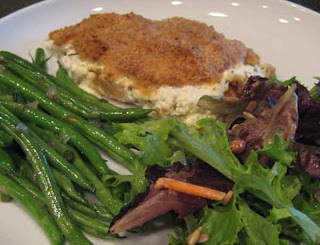 I served the chicken with a simple green salad and with a recipe for green beans (another one of those ingredients that I previously avoided) from my Food Network Kitchens How to Boil Water cookbook. You just boil green beans in salted water for 4 minutes, then run them under cold water. Dry them well, then saute finely chopped shallot (or garlic if you don't have a shallot) over medium heat with a little bit of EVOO for 2 minutes, then turn up the heat to high and add the green beans for about 4 minutes. Add a little salt and pepper and they're all done. 2. In a shallow bowl, whisk the eggs and set aside. Place the bread crumbs in another shallow bowl and season with salt and pepper. Add half the melted butter to the bread crumbs and combine. Keep the remaining butter warm for basting. This looks great. I'm going to give it a try. I saw another one in the Oct '06 issue that also looked good to me. It was called Walnut Crusted Chicken Stuffed with Spinach. It also used boneless chicken. Thanks for the review! You probably already know that Rach will be on the Daytime Emmy's Friday night. I just saw a commercial and she was in it. My post tomorrow is all about the Daytime Emmys! I'm keeping my fingers crossed. I'll have to try that Walnut Crusted Chicken - it sounds right up my alley. So many recipes, so little time. I've made that walnut chicken with spinach and it's good! This one looks good, too. Certainly not something our Grandma would have made, right Jeny?